[prMac.com] Naples, Italy - IdeaSolutions announces the launch of version 3.0 of the worldwide appreciated mobile app KYMS "Keep your media safe" that allows to hide and protect any multimedia files with military grade encryption. 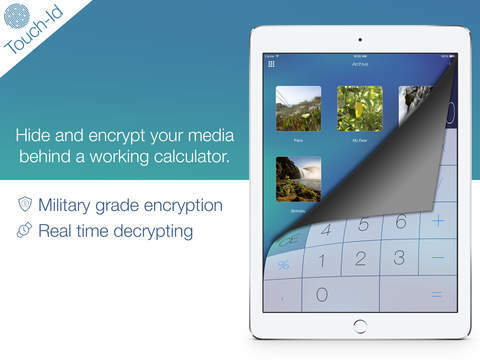 KYMS looks like a working and stylish calculator App but it hides an inviolable vault in which to hide and encrypt all your multimedia files, documents, passwords and much more with military grade security (AES Encryption). it also offers a powerful integrated multi-tab browser with enhanced download capabilities and private keychain. KYMS is available in English, Italian, Spanish, German, French, Japanese, and Simplified Chinese languages. KYMS 3.0.1 is available in both Free and Paid version ($1,99 USD); for both version are available the premium package as in-app purchase ($2.99). The Free version also allows users to remove advertising ($199). IdeaSolutions has been working for more than ten years in National and International market, establishing itself as one of the major Italian Software Houses. Among its achievements, apps for iPad and iPhone created for important customers such as the Teatro San Carlo in Naples, which reached the top of App Ranking. Copyright (C) 2014 IdeaSolutions srl. All Rights Reserved. Apple, the Apple logo, iPhone, iPod and iPad are registered trademarks of Apple Inc. in the U.S. and/or other countries.